Think about bananas, coconut milk, and honey, and the first thing which will probably come to your mind is a tropical smoothie! But did you know that this combination can actually be used to make an effective deep hair conditioner? This easy-to-follow nourishing conditioner recipe will leave your hair softer, smoother, and shinier! Bananas are rich in potassium that strengthens the hair and minimizes breakage by restoring your hair’s natural elasticity. It also facilitates repair of damaged hair. Banana also helps moisturize your locks as it contains natural oils and about 75% water. 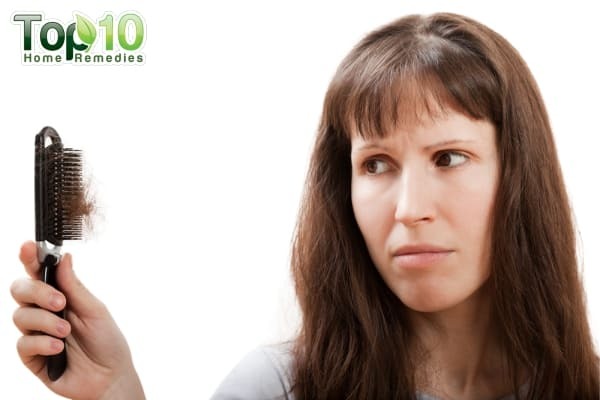 (1) Strong, moisturized hair is less prone to frizzing and tangling. Coconut milk – Coconut milk is loaded with antioxidants and fats. It will help condition your hair and strengthen them with proteins and oils. It can also help boost the hair volume. 1. 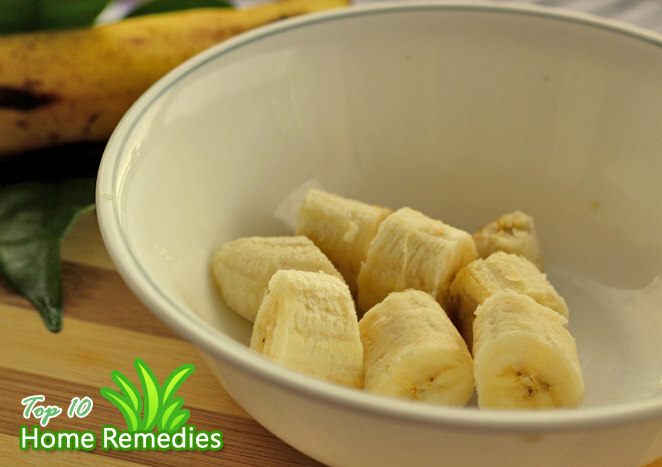 Cut the banana into pieces and place them in a bowl. 2. Add two tablespoons of coconut milk. 3. Add one tablespoon of coconut oil. 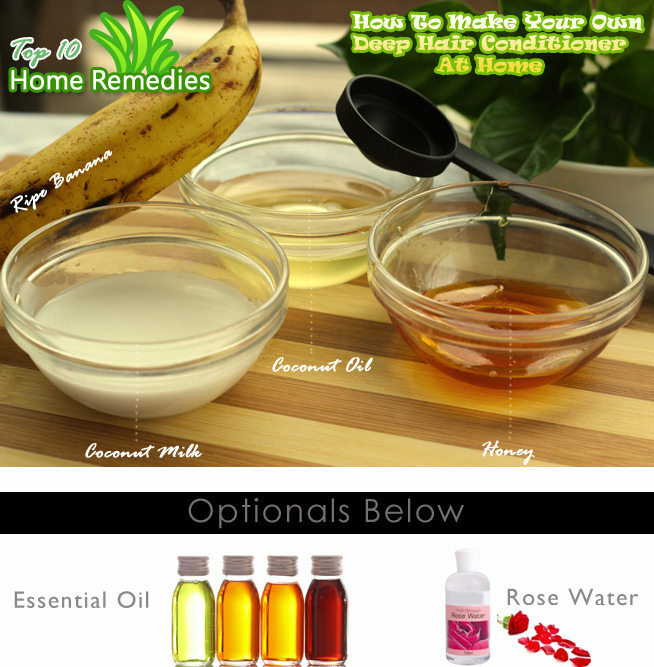 You may add another tablespoon of oil if you have dry, frizzy hair. 4. Mix in two tablespoons of honey. 5. 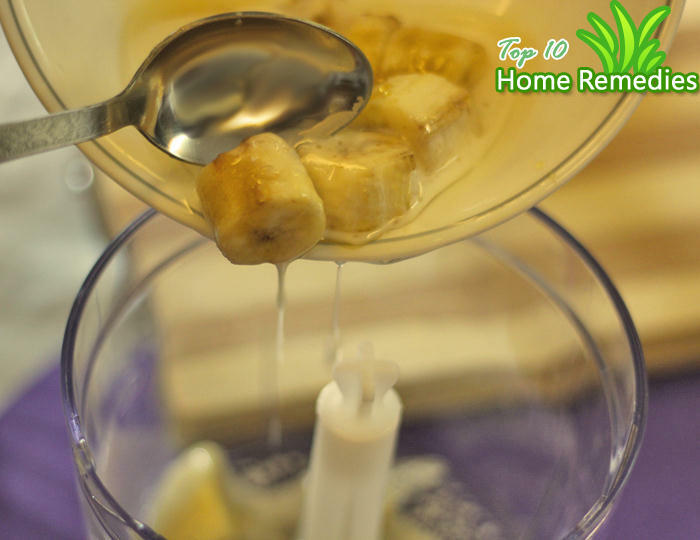 Transfer the contents into a blender and blend for 45 to 60 seconds till you get a smooth mixture without any chunks. 6. 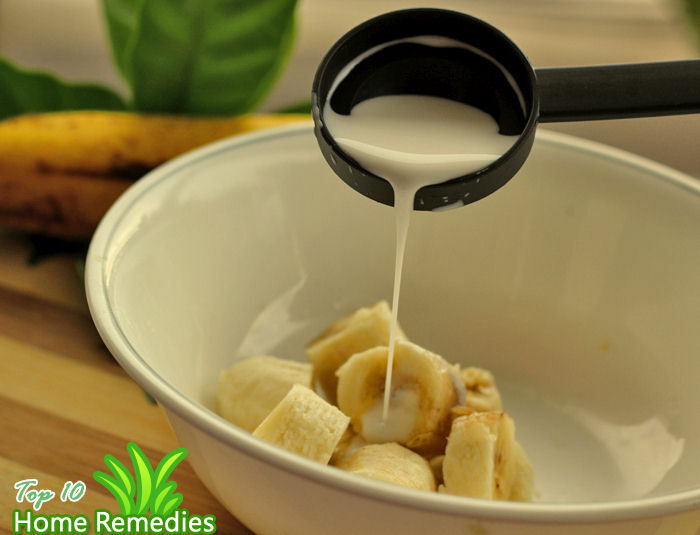 Your DIY banana hair conditioner is now ready to use. Massage the mixture into your hair. Let the conditioner sit for at least 30 minutes. You may use this deep conditioner once a week. You can use overripe bananas to prepare this hair conditioner. Why let those brown, squishy bananas go to waste when you can put them to good use! Make sure the banana is pureed completely or bits of banana may get stuck in your hair and can be difficult to wash out. 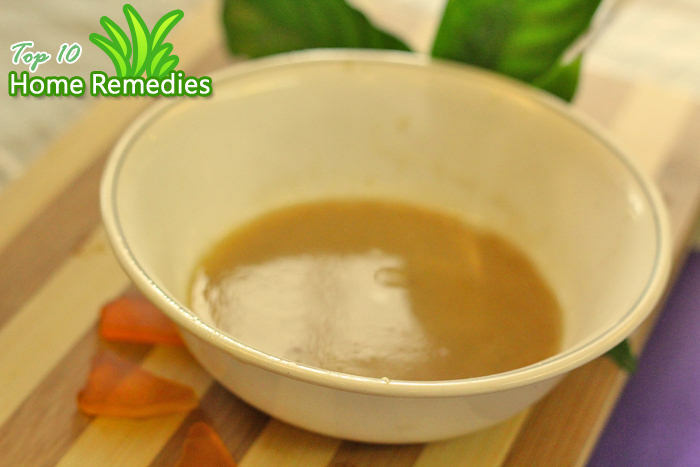 If you use solid coconut oil, add some warm water to the mixture while blending. If you find the smell of the mixture unpleasant, add a few drops of lavender oil, peppermint oil, or rosemary oil. Aside from masking the odor, these oils also facilitate hair growth! 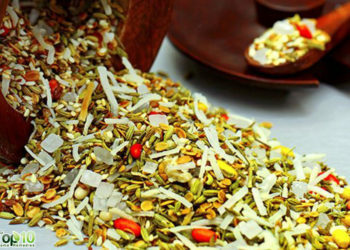 You may also use rose water. Kumar KPS, Bhowmik D. Traditional and Medicinal Uses of Banana. Pharmacognosy Journal. http://www.phytojournal.com/archives/?year=2012&vol=1&issue=3&part=A&ArticleId=22. Published September 1, 2012. Dias MFRG. Hair Cosmetics: An Overview – PubMed Central (PMC). International Journal of Trichology. https://www.ncbi.nlm.nih.gov/pmc/articles/PMC4387693/. Published 2015. Al-Waili NS. 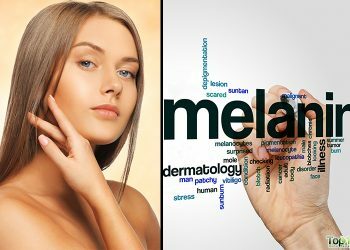 Therapeutic and prophylactic effects of crude honey on chronic seborrheic dermatitis and dandruff. European Journal of Medical Research. https://www.ncbi.nlm.nih.gov/pubmed/11485891. Published July 30, 2001. I got to know the first time that bananas can be used for our hair.Please be with me each and everytime for this new and amazing information. I would like to say thanks for sharing your knowledge on line. 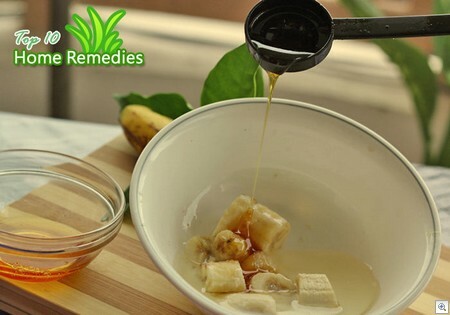 I have been looking for these types of home remedies although I haven’t tried them yet. I’m looking forward to good results. Thanks again. Can you make this ahead of time and possibly leave it in a jar? 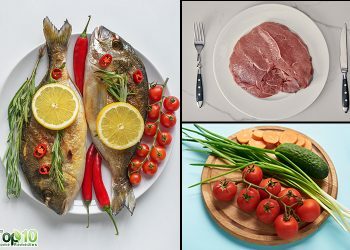 can you add more on facial home made? like that can relieve scar,body odor, bad breath and etc. thanks really like your blog keep it up! I tried the banana mask, but substituted 2 tsp olive oil. I have tried it with and without the avacado. This is amazing. My fine blond hair has more shine and elacticity. I find that banana’s over ripe work best. I have used it 3 times and I get comments all the time. You do not need a blender. 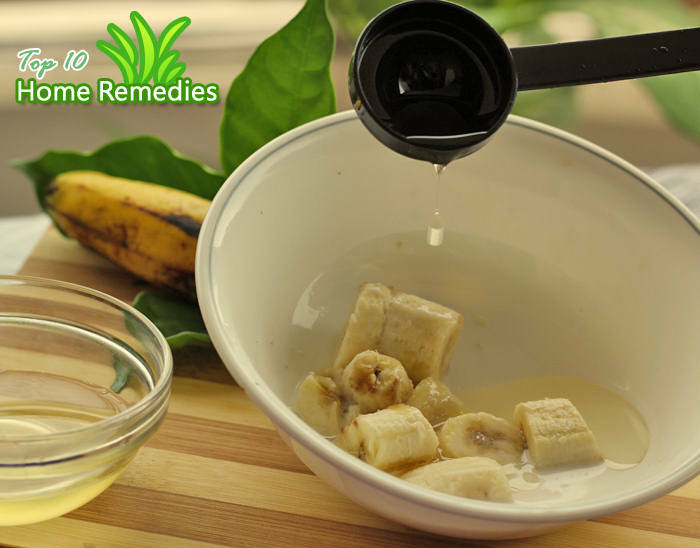 Mash up a banana or 2, add 2 tsp oilve oil, stir… Apply to dry hair, and work into your scalp and hair. Leave on for 30 minutes. Then wash with a mild shampoo, and your regular conditioner. Try to avoid flat irons. Avoid over processing your hair. If you need a weave. Ask for 5 foils instead of a full or partial. The effect is healthy hair. It works. well you! yes you! the owner of this fabulous site! I love you. Amazing, it seems delicious and effective too hahaha. Right now I am using the pro naturals argan oil hair mask and it is incredible good moisturizing the hair completely! wow! it so amazing but How long can we keep this on refrigerator? What will be the benefits of this deep conditioner?? Will definetly try this amazing hair mask. I just tried this recipe out. The hair does feel softer and yes it adds shine. I alsi added some olive oil to it. away. The banana remains as residue and I had to shampoo over again to get it off! no it does not untangle hair easily and yes it gives volume by fluffing off the hair! Sift it before you apply, duh! I used a small jar of banana baby food. Same benefits, no need to use a blender. The best way to get rid of the banana after using this mask is to comb your hair with a wide toothed comb during shampooing. honey makes the hair white faster. Do you mean it will make my hair turn white. I am almost 80 years old, and my hair is still mostly a dirty blonde or mousy color, with grey hairs and black hairs and white hairs mixed in, but not enough of the grey or white to lighten it. I love white hair. How do you use the honey to make your hair turn white? Very good .iam going to try it. Now, I just have a couple of questions….I saw someone else ask the first one but I didn’t see an answer to it so this is why I’m asking again….I apologize if I overlooked the answer…..
1. Once all the ingredients are mixed together, how long will the mixture last, refrigerated, of course? 2. My hair is on the longer side, a couple of inches below my bra strap, do I need to double ANY of the ingredients? Thanks & keep up the GREAT work y’all! thanks.. I will try to use this remedies.. I love this site. Natural remedies. how long can i keep this for? or i need to make a fresh batch every time i want to condition my hair? I’m loooooving it.wish i could bottle it and send to my mum!! This is a wonderful conditioner. 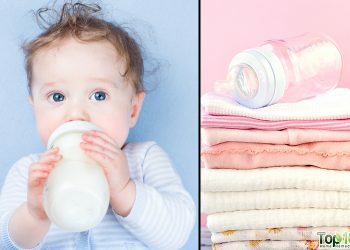 The idea of using a jar of banana baby food would be a great way to avoid needing a blender. Now I have found a great way to use overripe bananas besides making banana bread, too. I just applied this conditioner wow i super love it , can i use and apply it daily ? Thanks for sharing such wonderful things. This can be done for oily hairs also or just for dry or normal hair type. I have relaxed hair and I tried this hair mask last week and it really worked wonders. Added sheen and made my hair softer, with a silky feel to it. Also, I normally section my hair when I dry it and when I removed my clips where I had rolled and clipped them after I had dried all sections, my hair had nice curls in such a short time. I am thinking this would work really well with a roller set. Oh, rather than shampoo after the treatment, I shampooed before and just rinsed it out with water. If you use a blender and blend till there are no chunks, it washes off easily. The consistency is a bit runny, so be sure to protect whatever area you will be sitting and your clothes. I will try putting a head band over the plastic cup next time and see if this helps. I found this site by pure coincidence and I was just reading the comments. I must say, I am quite eager to try these on my hair, but I wonder if it will work on my African hair. And that Aloe vera face mask… Hmm, can’t wait! Really it works.. but my problem is how to get rid of the banana that is sticking to my hair even after the wash. I need any easy tips pls.. help me out to check diz problem. Wow!! This is an awesome recipe. Thanks for sharing this recipe. I love this site… This site is very usefull for me? Works great but the bananas got stuck in my hair . I washed and mixed mayonnaise and some conditioner together and my hair turned out great. Works great but I added in apple cider vinegar to the mix. The bananas got stuck in my hair so I washed again and then mixed some mayonnaise and conditioner together and combed through my hair rinsed out and my hair came out perfect. Will do again. I simply put all ingredients into a Ziploc bag and smooth them out with a rolling pin. After all the ingredients are smooth, I cut one tip of the bag and used it to pipe on my hair .Less mess ,no stress. I went searching for a Deep Hair Moisturizing Hair Treatment and ran across your site. I found this today (18 March 2018) and looked at all the ingredients and I had ALL of them! Since I cook with coconut oil, I also purchase the milk and creme for additional meals. I made this wonderful hair moisturizer; I used my blender, put the setting on puree and WOW! I tasted it and I liked the way it taste…I wonder. But anyway, I did the treatment, I sat under my hair dryer for about an hour and a half, let my hair cool down, shampooed (with my natural homemade Castile Tropical Shampoo); used my coconut oil to twist my hair and used Softee Styling Gel with Argan Oil on the ends and pinned my hair up and I am impressed! I prefer to make my own natural hair products and recently used and average store bought hair packets, (I won’t do that again). After the shampoo, my hair was so soft and easy to detangle (my hair wasn’t as tangled and separated nicely, I could run my fingers through my hair and there were no knots). I also noticed, no breakage! No hair was on the comb when I sectioned my hair! My hair was soft, smooth, felt great, looked great and I was very pleased with the overall appearance of my hair! THANK YOU AND THANK YOU! I didn’t realize how much this great hair moisturizer makes! No problem, I went downstairs to the basement, retrieved a pint size canning jar, poured the contents into the jar, labeled and dated and placed in the refrigerator. I will check daily to ensure the mixture is still good to use. I like this, I plan to continue to do this at least once a week! My hair does get dry and I may have to moisturize more often. But this is simple, quick and I love this! My natural hair looks so healthy after one use! THANK YOU!!! !